Every visitor soon knows that Rarotonga in the Cook Islands has beaches to enjoy, and motor scooters to hire for the drive right around the island. 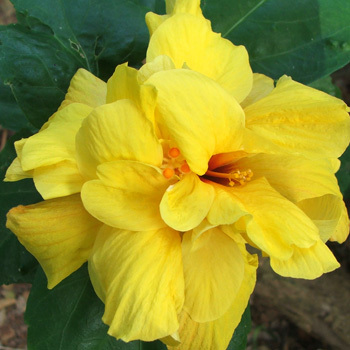 But there's more - the tropical Maire Nui Botanical Gardens are a must-see visit, and definitely more than once. Maire Nui sits on the coastal island road, and is brightly advertised, with its own attached cafe. By the way, the menu is simple and tasty, and the drinks include organic coffee grown on the nearby island of Atui - so there's no excuse for the non-gardener not to visit. 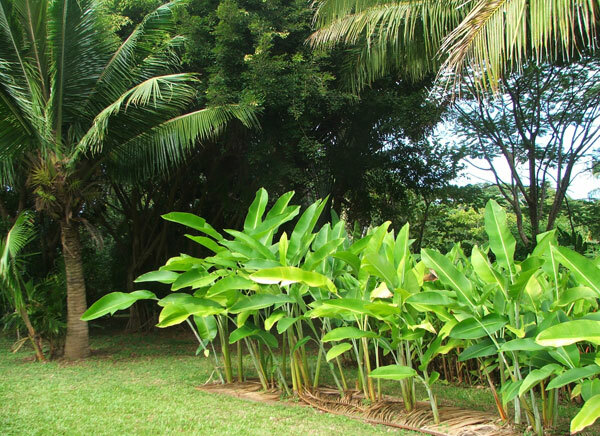 But even non-gardeners mustn't just sit in the shade munching and mopping their brows - the gardens are right there, beautifully expansive, with unexpected twists and turns, planted full of natural tropical treasures. Some areas are divided into traditional rectangles, rows of plants forming the walls of the garden rooms. But then there's a border with more of a wiggle, a long garden corridor, or a pond. Whether your garden style demands straight lines or curves, you'll find something to inspire. I was lucky enough to meet Maire Nui's gardener. The only question I could think to ask was 'Why? ', and I immediately realised that was absolutely silly. No real gardener needs a reason to start a garden, let alone expand and maintain it. And hardly any could give a reason you if they were asked, anyway. So I just thanked her and shuffled off shyly. So why visit Maire Nui at least twice? Coming from a temperate winter garden, on my first visit I was mesmerised by the flower and shrub colours. I needed a second visit to really appreciate how beautifully jumbled the gardens were, their 'design' so much more natural than that offered by the cosmetic up-market resorts. And I noticed and enjoyed the trees much more on my second visit, particularly the different varieties of skyline palms. Very few tropical plants are familiar to me, so I had fun matching my photographs with the pictures in the cafe album. In my gardening country, flowering gingers are banned. With such striking flower heads and rich colours I can see why naughty gardeners back home are tempted to break the law. 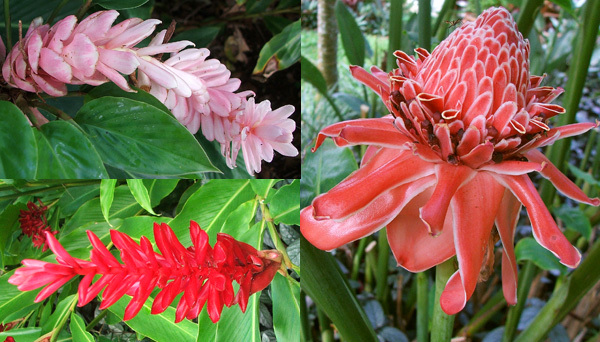 The stems and leaves of the luscious peachy Torch ginger are well over two meters high - what a beautiful invader this plant could be! Maire Nui is presented very naturally. Coconut husks and dead palm fronds are used as mulch (palm also makes an excellent path surface). The village is getting an industrial strength shredder very soon, so Maire Nui will be able to shred their mulch products and use them, for example, in hanging baskets. They also have 'Woofers' who visit and work in the gardens. This is a real garden where the compost heaps and the wheelbarrows are visible, and new features can be seen in progress. I loved the hedgerows of red and green 'Ti' plants, even if these are a pretty ho-hum feature in tropical garden design. On my second visit I looked a little more closely, and could see how this spiky plant was related to the Cordyline australis that I grow. What was my absolutely favourite foliage plant? 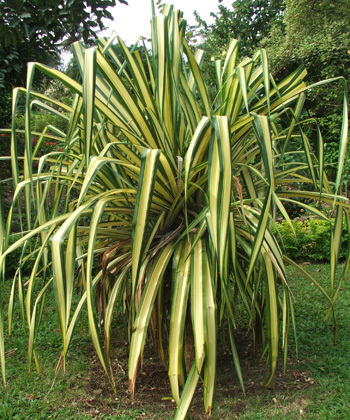 The wonderful yellow and green striped Pandanus, a spiky no-nonsense clump of yellow and green, looks like my sort of plant. So many of its neighbours have well-shaped, glossy green leaves that Pandanus stands out beautifully in contrast. I believe these leaves were used in traditional Rarotongan house construction. 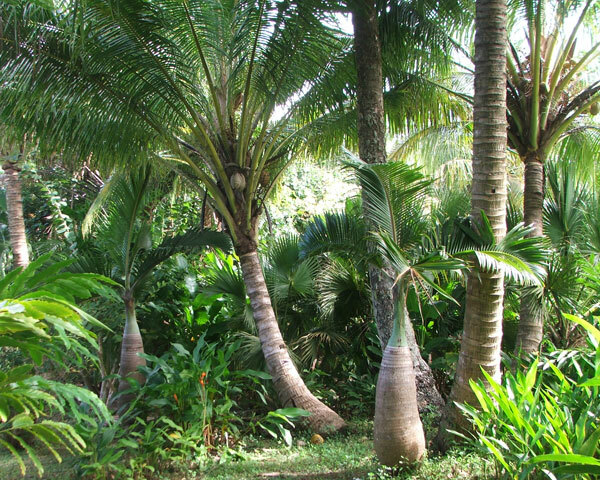 So if you're in Rarotonga, please don't miss seeing the Maire Nui Gardens. Be prepared to revisit. After strolling around, enjoy the cafe, sit in the shade, look at the garden photographs, and marvel! Maybe you'll even pop back for another look around. It's a wonderful garden.